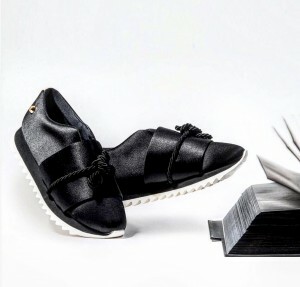 JUDARI, a premium shoe label, was founded in Milan in 2006. A theme that has always characterized JUDARI’s creations is the strong relationship between the art and fashion design. Shoe like an object of art! Rigorous construction, where the cut is the natural evolution of the lines, dramatic prints, unusual materials and new technologies where elegance is always closely connected to the exceptional quality, the chromatic choice is always accurate and recognizable, and the realization process of shoes is never submitted to a creative whim, but it is always conceived in a present projected into the future. The strong point of the JUDARI collections is the slip-on sneakers, first introdused for the SS15 season, a new luxurious and trendy way to interpret sports shoes, assuming strong couture connotations. The new couture sneaker leaves its comfort zone to be worn at even the most important occasions. The distinctive combination of gracefulness and modernism, elegance and sense of humor in the same time, paralleled with creative accessories, makes JUDARI brand add a striking fresh and unique style to the wardrobe of the modern day women.